When I grew up I used to play a lot of Role playing games and especially I played a Swedish game called Drakar & Demoner (Dragons &Demons). Most of the adventures they released took place in a campaign world called Ereb Altor. At that time I thought the world was one of the coolest places for an adventure that existed, and I must say that the maps I saw then and the adventures I read really has influenced me a lot. As I might have mentioned earlier making maps is my hobby, during the days I work as an IT-engineer, so mapping is something I do in my spare time. For that reason I’m very restrictive when it comes to taking up commissions, making maps for someone else means that I can’t make them for myself. But when I realized that the world Ereb Altor still was alive and that people still actually were working on new material I just couldn’t turn it down. So after a short introduction to the people running the site I was asked to do a map of Kartotum, the capital city of Palinor. Making this city however turned out to a bit of a challenge. So far all of my city maps have been done in City Designer 3 (CD3) from Profantasy, a great program when it comes to make cities. However the program has its weak sides, and one of those is that it works best when it comes to making cities without too much elevation. Of course you can draw some elevation in the program, but not in a way that I wanted to do it. You see Kartotum is situated on the slopes of a mountain so it is surrounded by great cliffs, and to draw that in CD3 was something way out of my league, if it’s even possible. So I decided to make the city and all the houses in CD3 and then draw the cliffs by using a combination of both Artrage pro and Photoshop. But to do this I first had to mark out the area in CD3 where the cliffs would be. To do this I added a green colour, different from the actual grassland, where I later would add the cliffs, as you can see in the map below. In this way I could place the symbols correctly in CD3. When the city was done in CD3 I exported the map and opened it up in Photoshop. In Photoshop I added the black lines for the cliffs and saved the image as a .PSD file. The actual shadows around the lines I decided to add in Artrage Pro. The water colour brushes in that program are absolutely fantastic and in this way I could get the shadows exactly as I wanted them. I also added the colour of the cliffs in Artrage before opening the file in Photoshop again to add some finishing shadows and light effects. Working on this commission has teached me a lot when it comes to adapting to some one else’s ideas and opinion and I must say that in some ways it’s even more relaxing doing maps for someone else than yourself. Suddenly you don’t need to come up with all the story and explanation to all the stuff you make. That is someone else’s headache. 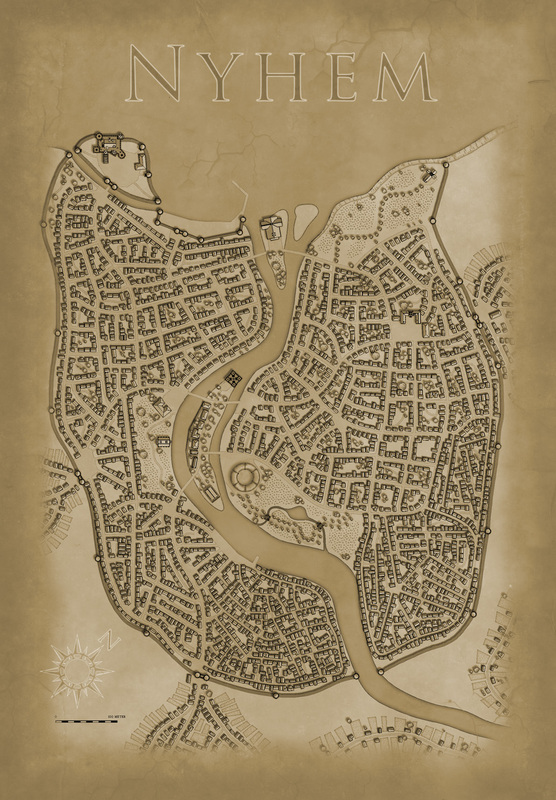 As you might have noticed I really like to make city maps. I don’t know why but I just love to see how a blank paper slowly turns into crawling streets and vast parks. It makes my imagination really spin. Most of my city maps I make in the program City designer 3 (CD3) from profantasy. It is a great program with a huge toolbox you can use to make the creation of your cities a much smoother experience. To make the maps more unique I also like to edit them a bit in Photoshop afterwards. When I bought CD3 my first impression of the program however was quite different. You can easily describe it in one word, overwhelmed. Just the sheer number of tools and objects made me fear for my mental health. The first time I started the program I think I just closed it immediately. So how did I go from there to where I am now? Well the answer can actually be divided in three parts. First of all practice. I started out quite small with a little village and first after a couple of small practice maps I went for the bigger cities or towns. Secondly I looked up some tutorials, especially Gandwarfs tutorials over at the cartographer’s guild where extremely helpful. Thirdly there was a black and white city style released in the 2010 annual from Profantasy. So what was so great with the black and white city style? First of all you get a very nice tutorial in every edition of the Annual, this makes it very easy to learn a new style, you can just follow the steps described. For me this meant a lot when it came to learning CD3, because I could in this way quickly pick up the different tools to use. Secondly the amount of objects decreased quite a lot in the black and white city style compared to the coloured styles that were included in the actual program. This might sound a bit odd but the good thing here was that suddenly the program didn’t feel as overwhelming as before. When the choices in objects decreased, it kind of made it easier to grasp the program and find what you were looking for. The map included in this post is a map that I made while trying to learn CD3. 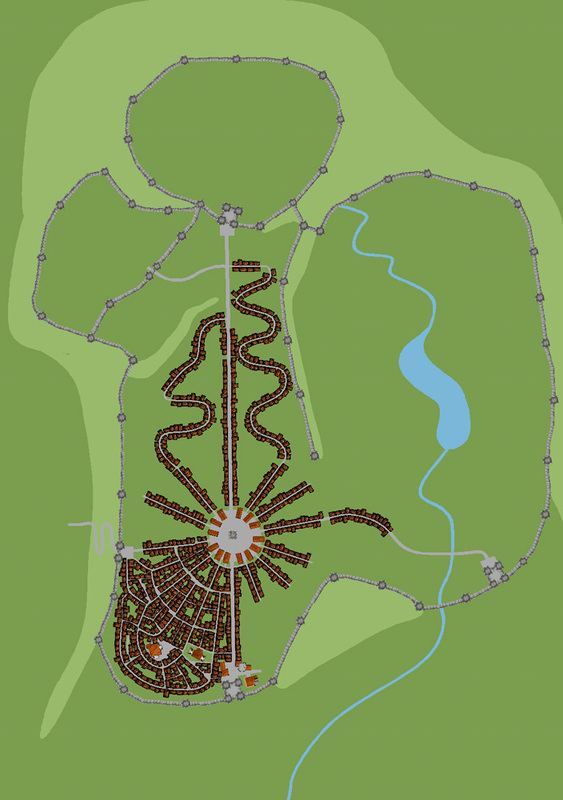 It was one of my first experiments to make a really large city map. I especially experimented a lot with the random street tool in this one. The random street tool is really a great help when you quickly need to fill and area with many houses. When I was done in CD3 I opened the file in Photoshop and added some cliffs on the northwest side of the city. I also draw my own arena object to add to the city, I really missed that object in the style. As a finishing touch I made the map sepia coloured and placed the map on a paper background. 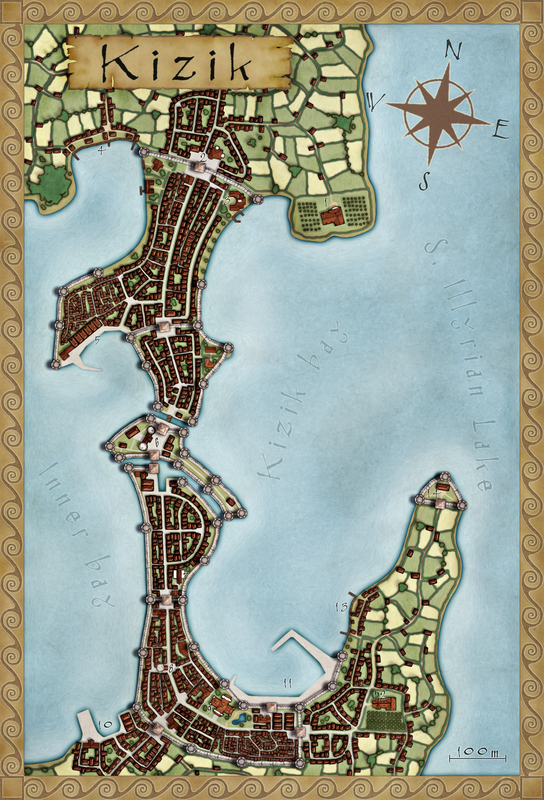 This is the town of Kizik, also referred to as ”The Krugian lock”. 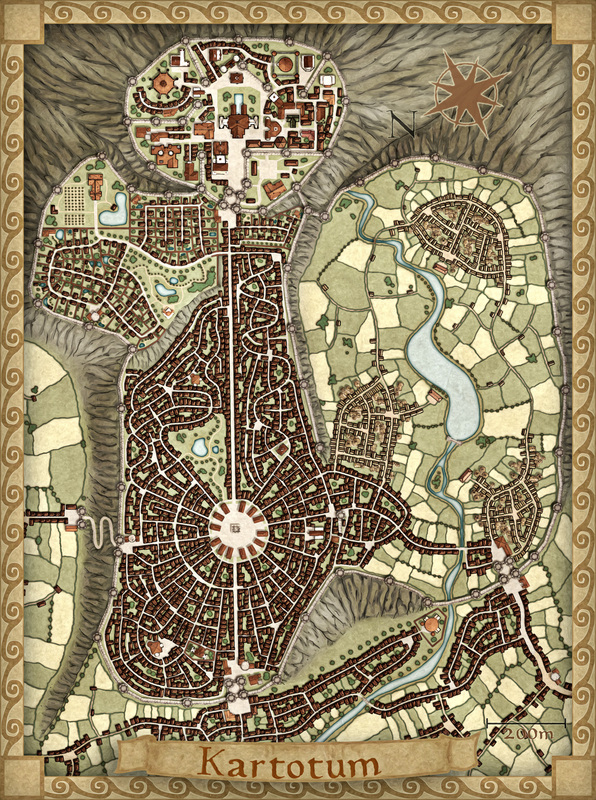 The town is placed in one of the more densely populated areas in the Etrakien world where the three countries Krug, Truscia and Illyrien meet. In this three border area the trade is blooming as well as the tension between the countries rulers. 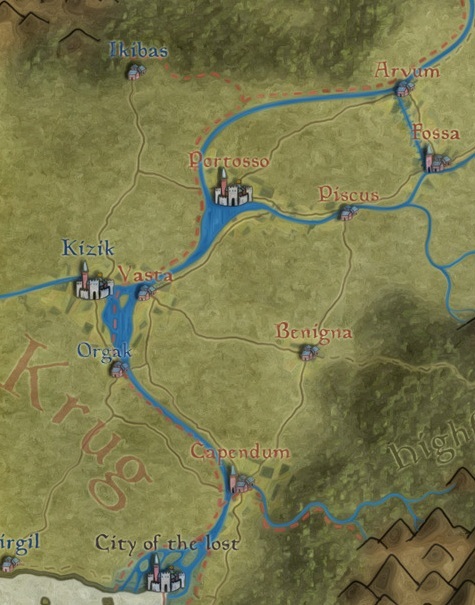 Krug is closely allied with Ankh-Bathor, the city of trade, and Truscia has very close ties to the Etrakien Empire. It might be worth to mention that The Etrakien Empire claims that Ankh-Bathor rightfully belongs to them, a statement that the powerful city state obviously doesn’t agree on. The third country Illyrien mainly has to deal with the problems and opportunities that the northern border to the eternal forest gives them. As a fourth power in the area you also have the City of the lost that is situated in the middle of a vast river delta where the river illum meets the Etrakien sea. The area has seen both one and two military campaigns that mainly has brought death and destruction to the farmers and workers in the area while the kings and their lords has fought for control of the land. But lately the income from the trade has become more and more important to the ruling class so the last couple of years the area has been relatively calm, even though the tension is growing and smaller skirmishes has taken place. The growing strength of the Etrakien Empire and its ambitious future plans might however put a stop to this peaceful time. The name “The Krugian lock” the city got from the fact that it controls the entrance to the river Kaznik, that is the major river in Krug. Because of this the tactical importance of the city is very big. If you look back in our own history you will see that rivers where the highways of the past, roads where in many ways hard and dangerous to travel. A boat on the river could travel in a far greater speed then a traveler by foot or wagon. Of course there are exceptions if you look at the roman roads that where a marvel of engineering art. Roads that let you travel fast and far, but they are an exception, most of the time if you look historically roads were not more than a trampled path between the villages. Another difference from today is actually that it generally was easier to travel in the winter. When the rivers froze you had great even roads where you easily could travel. This of course applies only to places where you have a river. Travelling on roads in the winter time was not a good idea. The map is made in City Designer 3 and Photoshop CS5.